Patients with advanced papillary renal cell carcinoma (PRCC) have limited therapeutic options. PRCC may involve activation of the MET pathway, for example, through gene amplification or mutations. Savolitinib (AZD6094, HMPL-504, volitinib) is a highly selective MET tyrosine kinase inhibitor. We report results of a single-arm, multicenter, phase II study evaluating the safety and efficacy of savolitinib in patients with PRCC according to MET status. Patients with histologically confirmed locally advanced or metastatic PRCC were enrolled and received savolitinib 600 mg orally once daily. MET-driven PRCC was defined as any of the following: chromosome 7 copy gain, focal MET or HGF gene amplification, or MET kinase domain mutations. Efficacy was assessed according to MET status. Safety, toxicity, and patient-reported health-related quality-of-life outcomes were assessed in all patients. Of 109 patients treated, PRCC was MET driven in 44 (40%) and MET independent in 46 (42%); MET status was unknown in 19 (17%). MET-driven PRCC was strongly associated with response; there were eight confirmed partial responders with MET-driven disease (18%), but none with MET-independent disease (P = .002). Median progression-free survival for patients with MET-driven and MET-independent PRCC was 6.2 months (95% CI, 4.1 to 7.0 months) and 1.4 months (95% CI, 1.4 to 2.7 months), respectively (hazard ratio, 0.33; 95% CI, 0.20 to 0.52; log-rank P < .001). The most frequent adverse events associated with savolitinib were nausea, fatigue, vomiting, and peripheral edema. 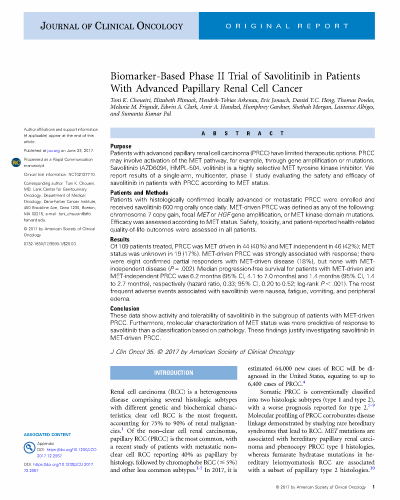 These data show activity and tolerability of savolitinib in the subgroup of patients with MET-driven PRCC. Furthermore, molecular characterization of MET status was more predictive of response to savolitinib than a classification based on pathology. These findings justify investigating savolitinib in MET-driven PRCC.